Yet another week without me being able to commit to a recap of the Life of Pete. So be it. However, I'm still not out of dog mode yet. We talk about them. We think about them. When I see one on the street, as we drive by, I give the walking dog "incidental music". I used to do that before we go Petey too. When we had him, I found that made up music went away when I saw other pooches. 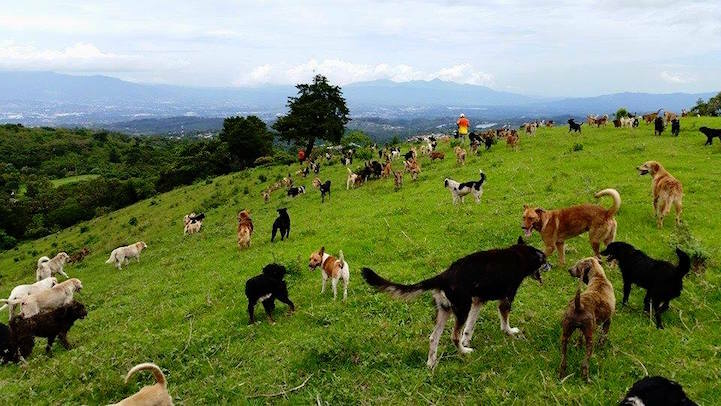 As I was perusing doggie stuff on-line, I came across a place in Costa Rica I just must visit. Since the Outer Banks is clearly on the do not fly (to) list this year, maybe Costa Rica is the place for us. Oh sure, some folks would kick back at the beach or a resort pool / bar. And of course, I'd do that here and there. But they have a site there that seems so spectacular, that I'd assume I would trek over to each and every day while in that paradise. 900 stray dogs in one location. Fed, housed, exercised, bathed, cared for. And adoptable. But even if you don't adopt, you can go on-site for free to play and help exercise the pups. It seems overwhelming but cute. I'd love to go, but I don't know how one could ever leave without taking a precious pup home. Or four. I suppose I could have called this post "Heaven in a Place on Earth", because I'm guessing this is the closest it comes. Heaven on earth is right! When I come home from a trip I lay down on the floor and my six tumble all over me. It's the best part of travel. I'd have to pack a trunkful of strays to take with me, too! I would want to take all of them home.